With the financial support of a three-month fellowship grant of the GSGS, I could continue working on my PhD project, which is part of the Intercontinental Scientific Drilling Project (ICDP) Towuti Drilling Project (TDP). Following a three-year contract (financed by the DFG), I got this GSGS grant from January to March 2018. Within this period, I finished my dissertation with the title: “Decadal- to orbital-scale climate variability in the Indo-Pacific Warm Pool during the past ~650,000 years”, which contains four paper/manuscripts of the last three years with me as (co-) author. 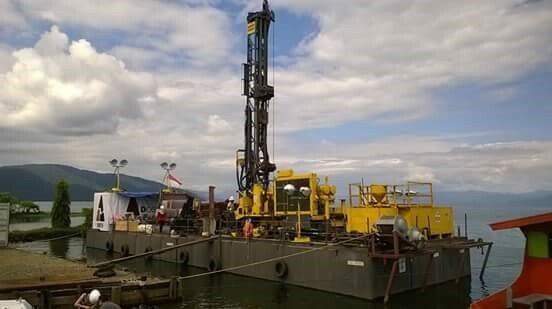 Furthermore, we were able to resubmit the paper “Modern sedimentation processes in Lake Towuti, Indonesia, revealed by the composition of surface sediments“ to the journal Sedimentology. During the funding period, I was part of the GSGS student committee organizing the annual GSGS Research Conference 2018. Afterwards I attend the 2nd TDP workshop in Makassar, Indonesia, by giving a talk about the results of my PhD sub-project with the title “Geochemical characterization of mass movement deposits triggered by various events – Studied at TDP Site 2 in Lake Towuti, Indonesia”. After the workshop, we made a field trip to Lake Towuti, which gave me the opportunity to network with the locals for an upcoming own field campaign. In addition, I presented my PhD work with a poster “Chemical characterization and genetic interpretation of mass-movement deposits at TDP Site 2, Lake Towuti, Indonesia” at the annual German ICDP/IODP meeting in Bochum in March 2018. Recently, I started to evaluate the last mineralogical and geochemical core data from TDP Site 2 and writing a second manuscript about the mass movement deposits, which make this drill site unique. Furthermore, I am writing a proposal for a Mobility Grant for Post-doctoral Research (University of Cologne) for the field campaign to Lake Towuti. I really appreciate the financial support of the GSGS, which gave me the unique opportunity to focus on finishing the dissertation.